WASHINGTON -- Brushing aside opposition from the Department of Justice, Republicans on the House intelligence committee voted Monday to release a classified memo that purports to show improper use of surveillance by the FBI and the Justice Department in the Russia investigation. The memo has become a political flashpoint, with President Donald Trump and many Republicans pushing for its release and suggesting that some in the Justice Department and FBI have conspired against the president. At the behest of Trump, White House chief of staff John Kelly and other White House officials have been in contact with Justice Department officials in the past week to convey the president's displeasure with the department's leadership on the issue specifically, the official said. In a series of calls last week, Kelly urged the Justice officials to do more within the bounds of the law to get the memo out, the official said. In the hours before Monday's vote, White House press secretary Sarah Huckabee Sanders underscored the administration's position, saying Trump favors "full transparency." Trump now has five days to decide whether he wants the information released. The panel could release the information five days after the vote if Trump doesn't object. Democrats are livid about the memo, which they say omits crucial facts and should not be selectively released. They have pushed back on Republican criticism of the FBI, saying it is an attempt to discredit special counsel Robert Mueller's investigation into Russian meddling in the 2016 election and whether Trump's campaign was involved. The probe has already resulted in charges against four of Trump's former campaign advisers and has recently moved closer to Trump's inner circle. The top Democrat on the House intelligence committee, California Rep. Adam Schiff, said last week that Democrats on the panel had put together their own memo. On Monday, the committee voted to make the Democratic memo available to all House members - but not the public. Texas Rep. Mike Conaway of Texas, who's leading the House's Russia investigation, said he was open to making it public after House members have a chance to review it. While Trump's White House signaled he would likely support the memo's release, his Justice Department has voiced concerns. In a letter to House intelligence committee Chairman Devin Nunes last week, Justice officials said releasing the classified memo could be "extraordinarily reckless" and asked to review it. 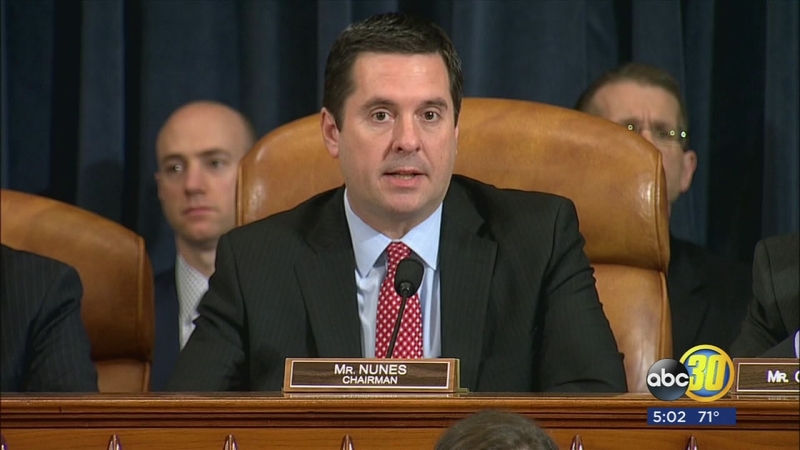 Assistant Attorney General Stephen Boyd wrote Nunes that given the panel's role in overseeing the nation's intelligence community, "you well understand the damaging impact that the release of classified material could have on our national security and our ability to share and receive sensitive information from friendly foreign governments." Some senators have expressed concern about the release as well. But John Cornyn of Texas, the No. 2 Senate Republican and a member of that chamber's intelligence committee, said last week that Nunes and the Justice Department need to work out their differences. On Sunday, Republican Sens. Susan Collins of Maine and Lindsey Graham of South Carolina both said they don't think the memo should be released. "No, I don't want it released yet," Graham said on ABC's "This Week." ''I don't. I want somebody who is without a political bias to come in and look at the allegations that I have seen." The fate of the memo is the latest flashpoint in the contentious relationship between Trump and the Justice Department. Trump has frequently raged at the head of the department, Attorney General Jeff Sessions, for recusing himself from the Russia probe, a move the president believes led to the appointment of Mueller. Trump has bemoaned, both privately and publicly, that Sessions and his department have not shown him the "loyalty" that former attorneys general Eric Holder and Robert Kennedy showed their presidents.